What a shock, another season comes and goes, and I don’t manage to get my end of the season article out until a month into the next season. Naturally I have a good reason for this, this time being the fact that I was busy moving during the end of the Summer season and start of the Fall season, meaning I didn’t exactly have any time to sit down and write a full article, or even watch that much anime for that matter. Trust me, it gnaws away at me too that I’ve been late with articles literally all dang year long, and hopefully, fingers crossed, this is the last one that will be drastically late like this for the year. Speaking of watching anime, damn was it hard for me to keep up with shows during this season. Not because I didn’t want to watch shows, I did, just didn’t have the time to watch much of anything on some weeks, causing me to periodically have to do binge sessions on my more liberated weeks to catch up. All told, only a paltry 11 shows have qualified for the genre awards for this season. 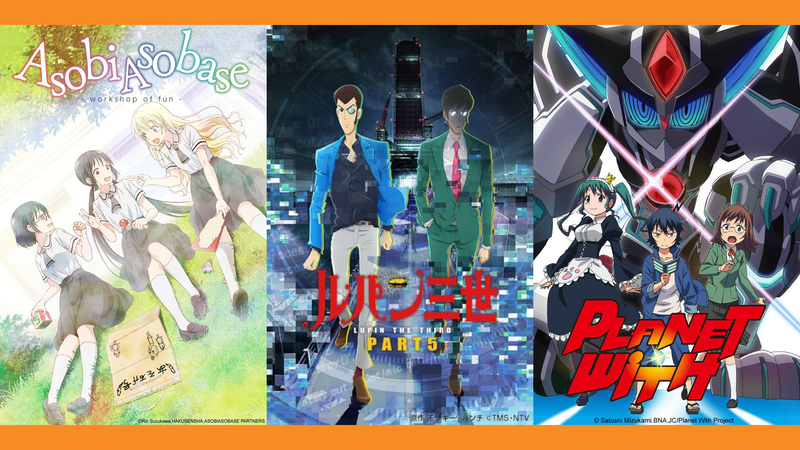 I didn’t get around to watching any of Netflix’s September anime releases(honestly I spent my September Netflix time on watching the latest season of BoJack Horseman instead), nor catch up on the other shows Amazon had that I was interested in. So it was just the 14 shows from my season progress report, and to explain where the other 3 went, well I actually just straight up dropped Chio’s School Road not long after writing the progress report, and Banana Fish and Attack on Titan Season 3 aren’t eligible for the genre awards due to my rule that they are only for shows/seasons that end during the season. That last part is the key point here, and thus why AoT isn’t eligible. It didn’t end until two weeks into the Fall season. This article may be late, but I’m not gonna bend that rule here. Nevertheless, they are still perfectly eligible for the production awards, as those are more or less meant for anything that happened during the course of the season. So now that my, unfortunately becoming quite customary, state of the union rant is out of the way, let’s get started with my genre awards. I’m gonna be real with you guys, I just wasn’t feeling most of the openings or endings from this season. Honestly, the OP I rewatched the most this season was last season’s winner, “Winding Road” from Golden Kamuy. Out of the ones actually from this season, it just wasn’t a contest for me. Angolmois’ OP got watched the most by me this season. That’s not to say some of the other shows didn’t have good OPs. For example, My Hero Academia had a pretty catchy theme this season, Banana Fish’s OP is just all around pretty damn good and honestly the closest thing to a runner-up I had in this category this season, Asobi Asobase had one of the greatest bait and switch OPs in the medium that was legitimately good on its own, and HANEBADO! had a good song and some gorgeous animation that is unfortunately undermined thanks to this animation bookending copious amounts of re-used footage from the show itself. Now granted, yes, this OP also re-uses footage, quite extensively at that, but not in the way HANEBADO!’s does. This one changes things up a bit, giving the characters in the footage some beautifully messy and thick outlines that makes them look like they came out of a Japanese painting. Plus, while the song in HANEBADO!’s OP is good, to me it has nothing on “Braver”. The song and OP start off slow, building ever so much over time, and then it suddenly cuts into just a solid minute of chorus after sweeping across the Mongol fleet. Trust me, having heard the full version of the song I can confirm, everything after the title drop on the OP is parts from the chorus in the song. Which makes it one of the more unique OPs, song wise, in a year that already has a lot of unconventional OP song choices. Probably my favorite aspect of the song, however, is the sheer emotional electric guitar playing throughout the chorus. It is somewhat subtle, but it gives the song a stronger punch to me. The race for my favorite ED of the season was even more dire than the OP race. I honestly don’t think I’ve had this many EDs I’ve skipped or just weren’t interested in, and I’m usually the kind of the person that will just let the ED play. I did have a few favorites, such Banana Fish’s, Steins;Gate 0's, Attack on Titan’s, and Angolmois’, but my far and away favorite, in quite possibly one of the easiest choices I’ve ever had to make in terms of my favorite OP or ED in a season, is the excellent metal ED to Asobi Asobase that is far more fitting for the trio of shitheads that form the core cast. I quite like metal, especially when it is used for anime OPs and EDs, so I was instantly in love with this the first time I heard it. For a good bit of time the winner I actually had penciled in here was kind of cheating. What I mean was, originally I was going to give a sort of “group win” to all of the amazing callbacks in the later portion of Lupin the 3rd Part 5, but that wasn’t exactly fair, because that’s multiple moments all being grouped together, and this award is meant for my favorite singular moment or scene from the season, and when sticking to the spirit of the award, there just wasn’t anything else I felt I could give the award to this season other than the just absolutely stunning chase scene from the second episode of Attack on Titan Season 3 that finds fan favorite Titan-slaying buzzsaw Levi desperately, and narrowly, avoiding death at the hands of Kenny the Ripper and his human-combat squad. 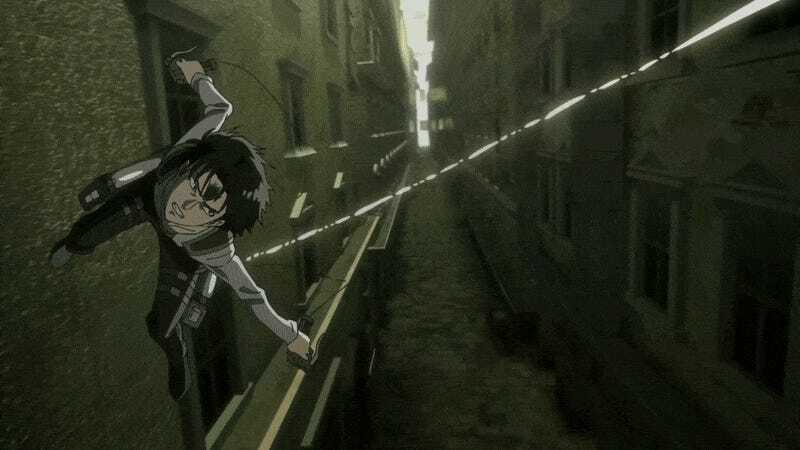 The crowning moment of this chase being the sequence above, which is basically animation’s answer to the long take camera shot from filmmaking. In a shocking twist, despite this season having both My Hero Academia and Attack on Titan, franchises that both won my seasonal favorite soundtrack award before, this time the nod goes to neither. Frankly speaking both shows didn’t really impress me much this time around with their new musical material. In Attack of Titan’s case, some of the new music is actually quite...questionable. A very rare misstep for the phenomenal Hiroyuki Sawano. Instead, the show to win me over with its music is the latest entry in the Lupin the 3rd franchise, yet again composed by Yuji Ohno, who is basically tied to the franchise by the hip. Many of the songs he used this time around are new takes on Lupin classics, but given a new breath of life by infusing French musical influences. Much of it isn’t groundbreaking new material, but honestly this is a case of don’t fix what isn’t broken. Now this is certainly going to create some confused looks I’m sure, but this is after all favorite visuals, it isn’t just a purely animation award. With a show like Asobi Asobase, which I’ll fully admit isn’t likely to win animation awards any time soon, it lives and dies on its ability to utilize its visuals to help sell its gags. Needless to say, Asobi Asobase nails this with flying colors. If it wasn’t for how consistently creative and hilarious the various character reaction shots were, I really don’t think the show would have been anywhere near as funny as it ended up being. Out of all the shows I saw this season, this was easily the one most heavily reliant on its visuals being what they were. Obviously I loved the visuals in other shows this season too, such as Planet With’s glorious throwback aesthetic to early-to-mid 2000s anime, or HANEBADO!’s oftentimes stunning animation, or the just all around phenomenal work MAPPA did with Banana Fish, but to me those shows were enhanced by their visuals and not as dependent on them as Asobi Asobase was. It was already a contender for this award last season, so all it had to do to contend again was stay course, but Lupin the 3rd of course couldn’t do that. Instead the show just kept ramping it up as it went, somehow finding a way to continuously get better and better as it went, and had biting commentary on things ranging from our reliance on technology to the dangers of giving too much power to companies, taking a detour to also poke a little fun at how America likes to topple foreign powers for their own personal interests. All the while still maintaining the excellent character writing that made it a contender in the Spring season in the first place. Though, Lupin didn’t exactly win this award running away. It was really difficult for me to choose between this, Planet With, and Asobi Asobase. Planet With almost won for having so much stuff crammed into only a single cour of episodes, we’re talking the amount of material some shows take two or even three cours to cover, and the pacing never felt off. Not to mention the show also had its own great character writing. Asobi Asobase also almost won on the strength of its jokes, because it is hard to write a comedy series were the majority of the jokes land, but Asobi Asobase manages to do this, on top of effortlessly handling the difficult balancing act that is having a main cast comprised of assholes. Ultimately though, Lupin the 3rd was just too damn good for the others to compete with. And now we move on to the genre awards. This just wasn’t a contest, really. Planet With just kept getting better and more confident as the show went on, which is saying something as the show launched out of the starting gate already feeling pretty confident in itself. It was only further aided by its only eligible competition stumbling down the stretch. Angolmois was very fun historical fiction for most of its run, but the last few episodes suddenly had an influx of issues just all deciding to pile up at the same time. The biggest issue being a weird sense of time management in terms of focus. Several dramatic and would be emotional moments get severely undercut because the show moves on from them way too quickly while things that probably should have been dealt with quickly was allowed to be drawn out. On top of this, the show’s animation took a big hit in its final episodes, which is a shame because the animation was one of the strongest things about the show early on. My Hero Academia wasn’t bad, it is just the material in this second half to its season wasn’t as phenomenal as what we got in the first half of the season. It was still very much entertaining to watch, it just wasn’t at the same level. So against this type of competition Planet With had little to worry about, thanks to its aforementioned tight writing, combined with its great visuals, and some surprisingly great use of CGI and a sound design that, while not to everyone’s taste, granted more impact to the fight scenes. So in one of the easiest decisions of the season, thanks to it being unopposed, Lupin the 3rd takes the adventure category. Now even if it had actual competition, it would still win quite handily. The latest, and possibly greatest, entry in the franchise has Lupin and friends hopping all over the globe as they try to find any remaining shadows to lurk in while living in an ever connecting world. On top of being just a great show in and of itself, this season of Lupin was also a celebration of the series up to this point, featuring cameos and callbacks from throughout the history of the franchise. Not to mention working in some incredible throwback episodes between each of the miniature arcs this season contained. Much like the favorite adventure category, this was an easy decision, and this was the inevitable result even when I had Chio’s School Road as part of my lineup. The gulf between these two shows was just that vast for me. In every possible facet I felt like Asobi Asobase was the better show. From the writing, to the visuals, to the music, to the characters. Hanako alone locked Asobi Asobase into winning this award, more specifically the incredible performance by her voice actress Hina Kino, who just put her all into each line delivery, be they one of Hanako’s smug lines or one of her many screamed lines. I honestly don’t think I’ll ever forget this show. This had to be quite possibly one of the funniest shows I’ve seen in years. So, up until the final episode for HANEBADO!, these two shows had their places swapped. I knew HANEBADO! was flawed, but I still really enjoyed the show despite those flaws. However, it really did come down to how the two shows ended, and Steins;Gate 0 ended on a strong note, where as HANEBADO! ends, but it doesn’t really resolve much of anything. There are still important things not entirely addressed, such as Ayano’s relationship with her mom and step sister. Which isn’t really a good thing, because those were kind of the main driving parts of the series. Ayano was the way she was because of how her mother rather cruelly just up and left her after Ayano lost a badminton match. Steins;Gate 0 may have stumbled in some areas, especially during the majority of the second half with the biggest offense being how drawn out it was, and I’m probably not going to watch it again, at least not for a while, but it is still Steins;Gate, and as such it was able to edge out HANEBADO! just enough to squeak out the win and become, rather fittingly paradoxical, both my most disappointing show of the season and my favorite drama series of the season. The first time all year I actually had multiple shorts to compete with each other for my favorite shorts series award, and both of them just so happened to be the third seasons in shorts I greatly enjoyed! Unfortunately, despite this season of Ninja Girl & Samurai Master being probably its best one to date, certainly its most emotional one, I just prefer the Encouragement of Climb franchise more. While this season of Encouragement of Climb didn’t feature as much mountain climbing as usual, it made up for that by helping our characters grow more as they face new personal challenges. On top of that we got to see extended character interactions between combinations of characters we didn’t get to see much of in prior seasons. In addition, this season still had enough gorgeous scenes in the mountainous Japanese countryside to satisfy fans of the series. It was a change of pace from the usual, but I feel like it was one greatly needed. Taking the genre title seriously, we have a literal slice of life show taking the crown this season. Cells at Work! was a wonderful series about the “lives” our cells live. The show utilizes an excellent combination of comedy and badass action scenes to not only entertain viewers but also actually teach people about biology on the microscopic level and how our body works. It wasn’t a particularly deep series, but it was constantly entertaining, informative, and quite honestly far better than it probably should have been. Harukana Receive ultimately maintains its status of easiest watch of the season I bestowed upon it during the progress report. It exists, it is relaxing, it is sometimes funny, and just all around a fun watch. It wasn’t like other sports shows where things are super serious. Even when this show was at its most focused, it still had a calming edge to it, and exemplifies how sports anime are more times than not about the characters and not the sport they play, as the actual beach volleyball games in Harukana Receive only account for a fraction of what the show focuses on. I’ve always enjoyed Lupin the 3rd. It’s been one of those anime franchises to pop up in my life periodically over time. Never in my wildest dreams did I ever expect it to produce not only what was far and away my favorite show in a given season, but one of the strongest contenders for my favorite anime of the year. I just simply love this season of Lupin, top to bottom. They always find a way to pump life into the franchise and reinvent things for a new potential audience, but never quite to this extent. This was just a stellar entry in the Lupin series for both existing fans and newcomers alike. I know a lot of people are warded off thanks to that dreaded “Part 5" in the title, but fear not! Lupin is a franchise where you can pretty much jump into any part of it and hit the ground running. So yet again, if you haven’t seen this season of Lupin the 3rd yet, I implore you to please find the time to correct that! You won’t be wasting your time, trust me. So those are my favorites from the Summer 2018 season. In terms of medal breakdown, this is quite rough compared to the Winter and Spring. A total of 3 shows earned platinum medals this season, which is an increase of 2 over the Spring season, but in terms of gold medals, a mere 2 shows earned that this season, down a whopping 5 from the Spring’s 7. In a way, this is oddly consistent with the Summer season, it seems, as Summer last year only ultimately produced 2 gold medal shows and no platinum medals for me. Anyways, feel free to comment down below what shows you guys liked from the Summer season. Until next time!